46 W INTER 2018 PracticeLink.com features Explore potential career opportunities with AAFP CareerLink –a powerful, interactive job search engine dedicated to family physicians. 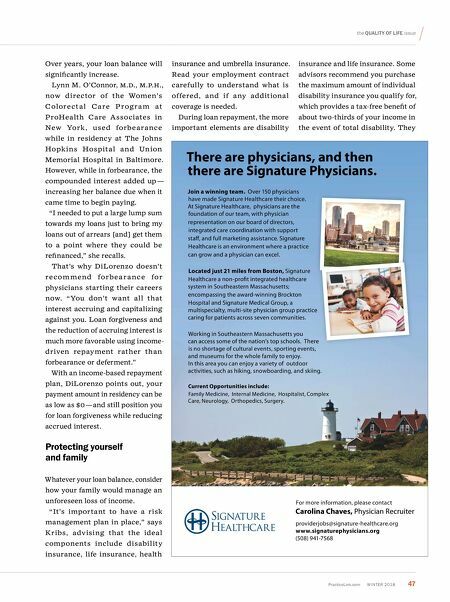 Because practicing family medicine is more than a job. 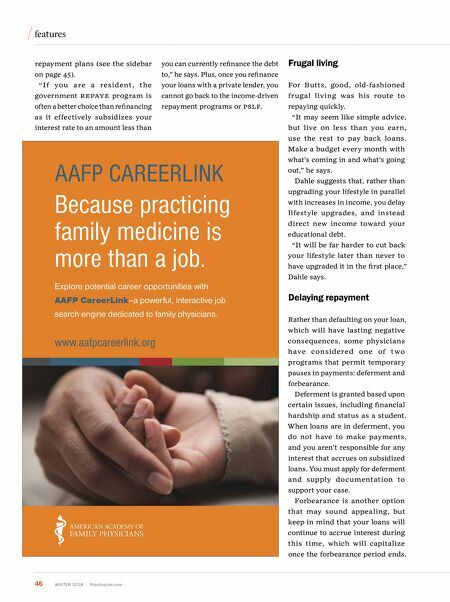 AAFP CAREERLINK www.aafpcareerlink.org repayment plans (see the sidebar on page 45). "I f you a re a resident, the government R e PAY e program is often a better choice than refinancing as it effectively subsidizes your interest rate to an amount less than you can currently refinance the debt to," he says. Plus, once you refinance your loans with a private lender, you cannot go back to the income-driven repayment programs or PS l F. Frugal living For Butts, good, old-fashioned frugal living was his route to repaying quickly. "It may seem like simple advice, but live on less than you earn, use the rest to pay back loans. Make a budget every month with what's coming in and what's going out," he says. Dahle suggests that, rather than upgrading your lifestyle in parallel with increases in income, you delay lifestyle upgrades, and instead direct new income toward your educational debt. "It will be far harder to cut back your lifestyle later than never to have upgraded it in the first place," Dahle says. Delaying repayment Rather than defaulting on your loan, which will have lasting negative consequences, some physicians have considered one of t wo programs that permit temporary pauses in payments: deferment and forbearance. Deferment is granted based upon certain issues, including financial hardship and status as a student. When loans are in deferment, you do not have to make payments, and you aren't responsible for any interest that accrues on subsidized loans. You must apply for deferment and supply docu mentation to support your case. Forbearance is another option that may sound appealing, but keep in mind that your loans will continue to accrue interest during this time, which will capitalize once the forbearance period ends.